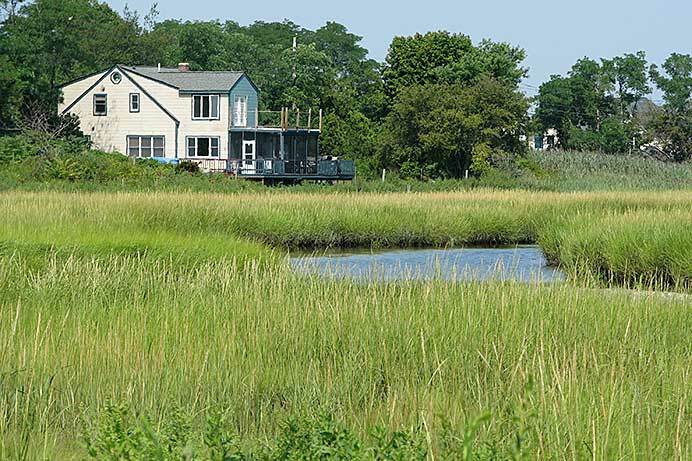 Protects salt marshes from current and future stressors: Salt marsh monitoring helps identify trends in marsh ponding, subsidence, vegetation change, and soil degradation, all of which are associated with sea level rise and other stressors. Monitoring data are critical to understanding and mitigating the effects of sea level rise on salt marshes. Monitoring can also help identify areas where marsh migration is occurring, and where opportunities exist to facilitate this process, for example, removing barriers such as walls or other shoreline structures that restore natural tidal flow, which is essential for salt marshes. Informs salt marsh restoration projects: For restoration projects, comparative monitoring at both the restoration site and at non-restored reference marshes provides information on the effectiveness of the restoration project and return on investment. Project monitoring is typically conducted within a BACI (Before, After, Control, Impact) design. 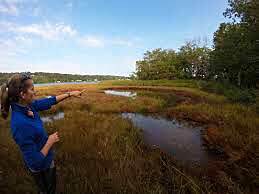 Caitlin Chaffee, CRMC, points out ponding in a salt marsh along Narrow River. Photo courtesy of Meredith Haas, Rhode Island Sea Grant. Salt marshes are coastal saline wetlands that are regularly flooded by tides. The dominant plant species in Rhode Island salt marshes are smooth cordgrass (Spartina alterniflora) in the low marsh (closest to the water) and saltmeadow cordgrass (Spartina patens) in the high marsh (farthest from the water and often closest to adjacent communities).They are unique and productive ecosystems that serve as critical habitat for fish, such as striped bass, because the salt marsh plants provide food, refuge from predators, and nursery habitat. Rhode Island’s shores are currently bordered by about 4000 acres of salt marshes, an area equaling over 3000 football fields. 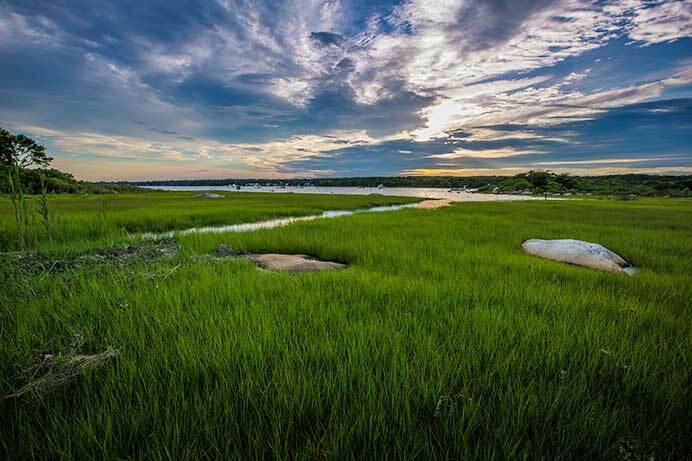 Salt marshes serve as a buffer between ocean and estuary waters and the coastal communities that abut them. They are often the first line of defense for coastal communities and habitats against coastal erosion, sea level rise, and tidal inundation.They also reduce erosion along Rhode Island’s shores by holding sediments in place with their root systems, which prevents the sediment from washing out with the tide, and by reducing wave height, which blunts the erosive power of waves. In addition, salt marshes filter contaminants and pollutants out of storm water runoff (rain water that runs across the land’s surface, picking up pollutants along the way, rather than seeping into the ground) thereby improving coastal water quality. $12 for carbon sequestration (removing and storing carbon from the atmosphere). Given the environmental and economic importance of salt marshes in Rhode Island, it is significantly concerning that approximately 53 percent of Rhode Island’s salt marshes have been destroyed or degraded through human activity over the last 200 years. The salt marshes that remain are threatened by rising sea levels and increasing frequency of strong coastal storms associated with climate change. Both the importance and vulnerability of salt marshes make them an important resource to monitor, especially in light of climate change. Salt marshes like this one in Warwick, Rhode Island, provide numerous ecosystem services. Photo courtesy of the Coastal Institute. Salt marshes protect the shore. Photo courtesy of Watershed Counts. Low Marsh: The zone located along the seaward edge of the salt marsh, below the mean high water line (average high tide level), but above the mean low water line (average low tide level). It is usually flooded at every tide and exposed during low tide. The tall beauty of smooth cordgrass (Spartina alterniflora) dominates this zone because it can withstand the daily flooding and salinity. High Marsh: The zone located along the landward edge of the salt marsh, above the mean high water line, is flooded less frequently than the low marsh. This zone is dominated by shrubs and marsh grasses, such as saltmeadow cordgrass (Spartina patens), spikegrass (Distichlis spicata), blackgrass (Juncus geradii), and the short form of smooth cordgrass.